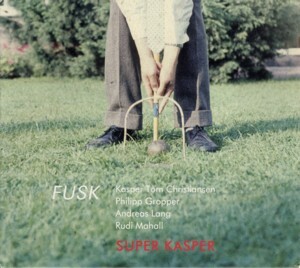 This is the second album by the Danish / German quartet FUSKFind albums by this artist led by Danish drummer / composer Kasper Tom ChristiansenFind albums by this artist, which also features the Danish bassist Andreas LangFind albums by this artist and the German saxophonist Philipp GropperFind albums by this artist and bass clarinetist Rudi MahallFind albums by this artist, who is also a member of the Kasper Tom 5Find albums by this artist ensemble. The album presents eleven original compositions, eight of which are by Christiansen and the remaining three are group improvisations. Christiansen is one of the most prolific young European Jazz personalities in the last decade and participates in several diverse ensembles in parallel, both led by him and by others, which involve musicians from different European countries. This kind of international collaboration is one of the most creative ingredients of the new European Jazz scene, where the artists can enjoy the freedom of movement without any restrictions and some take advantage of it quite broadly. As a result of his recordings Christiansen has established quite a reputation not only as a player and bandleader, but particularly as a superb composer of diverse stylistic approaches. His work is worth following across the broad spectrum of his creative output, of which FUSK is just a singularity. The music presented here emphasizes the freedom and openness in his compositions, which are based on short melodic themes which are then explored by the quartet quite liberally and without limitations. Of course even if the music is mostly improvised, both harmonically and rhythmically, it is neither chaotic nor disorganized, keeping well within the boundaries of group improvisation. The quartet members obviously listen to each other attentively and support each other constantly. There is an overall feeling of tenderness and respect and none of the aggression often associated with group improvisation is present here. The individual performances are all first class, with the two soloists obviously standing up front most of the time, but with the rhythm section firmly involved as well. Lang´s bass and Christiansen´s drumming are an excellent example of superb contemporary rhythm section work, which is nonabrasive and nonaggressive and yet keeps the music moving forward on a solid track. The music recorded on this album was also recorded live at the legendary Warsaw Pardon, To Tu club shortly before being recorded in the studio, and it´s highly recommended to listen to both versions, in order to appreciate the dramatic influence of a live audience on a Jazz performance. The live album is scheduled to be released on the Polish For TuneFind albums on this label label.